I visited my friend in an office building on Bourguiba, and we ran across the street to get crepes at the only place that was open on the whole avenue. The shops looked like eyes with their lids squeezed tight. I had seen the broken windows of days before- so it was no wonder the metals grates stayed shut. Another friend was waiting for me at the bookstore with her Mom. 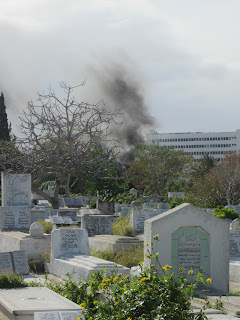 We started walking towards the cemetery, past barbed wire and police, down quiet sidestreets. 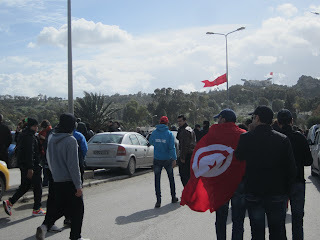 We were walking behind two young men, one of them clutching a large Tunisian flag in his hand. The sun had broken through the clouds, driving away the chill air, and under our warm layers we were beginning to perspire. As we turned the corner I saw a straggling line of people in front of me, coming from every direction and headed towards the cemetery. We crested a rise in the road, and there on the bridge, in the graveyard, on the other side of the wall, on the hill, were thousands of Tunisians. Their black coats and black hair made the red Tunisian flags stand out like bright drops of blood. I stood on a concrete slab and looked over the crowd- there were people of every age, of every economic class, and we were all waiting. One man had died with revolutionary dreams on his lips, and the pulsing life of these tens of thousands was here to prove that it was not in vain. We waited for a long time. First we tried to find a place to watch outside the cemetery. But, realizing that this was futile, we hopped down a wall into the rows of stones and began picking our way towards the buildings in the center. The mud squished up over our shoes, and the sky suddenly became cloudy and grey. The wind blew into the cracks in our coats as we reached the edge of a huge crowd that had gathered, and were chanting revolutionary slogans off and on. 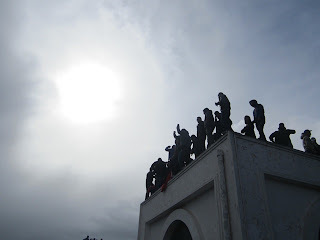 Young men, the kind you see on all the street corners of downtown Tunis, clad in tracksuits, jeans and leather jackets, were climbing the walls of the buildings, grabbing each others arms and heaving themselves up bars on the windows to stand on the roof and yell from above us. 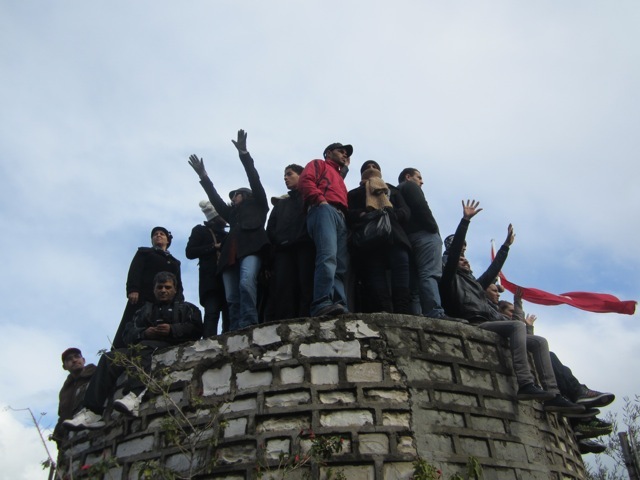 Beside me was a circular stone structure, and the students at the top stood, illuminated by the sun, waving a flag back and forth. The light made the hope on their faces shine bright as they called back and forth to the men on the roofs. It began to rain, and my friend and I sat underneath a bougainvillea bush. The flowers were curled up tight, as if they knew what was coming and were trying to protect themselves. The crowd chanted off and on for what must have been an hour. When rumours of tear gas shifted our way, my companions and I made a swift getaway to higher, more open ground at the edge of the crowd. We stood on a low wall with some mothers and daughters, and continued waiting. We weren’t waiting long before panic struck. We watched trickles of people making their way down the path towards the exit. The trickle became a flood, and along with it, the first whiffs of acrid tear gas. We didn’t join the crush of people on the path, but started in the opposite direction as the gas, stepping over graves and around tombstones. Beside me I heard a young girl whine in panic, “Maman...MAMAN!! !” I stepped aside to let the family keep together. I wondered how the two little girls who had been to my left were making out, but there was no time to check. The smell got worse, and began to burn my nose and throat. “Whatever you do, don’t rub your eyes- even if it hurts,” my friend warned beside me. I nodded. Her mother was having a hard time, coughing and tripping over stones. I dug in my bag for one of the cloths and handed it to her, then took her hand. The graves were no longer the last resting place of the dead, but only obstacles keeping us from fresh air. Reaching it, we breathed deeply. This side of the cemetery was almost deserted. There were no police, and no bands of thugs- yet. We found another exit and stood there, waiting again. I got a call from a radio station I freelance for, for an interview later in the day. We watched people go, and then watched some of those same people come back. A group of foreigners, who my friend and I dubbed, “hipster journalists” for their bright colours, headbands and expensive cameras, passed by us twice. 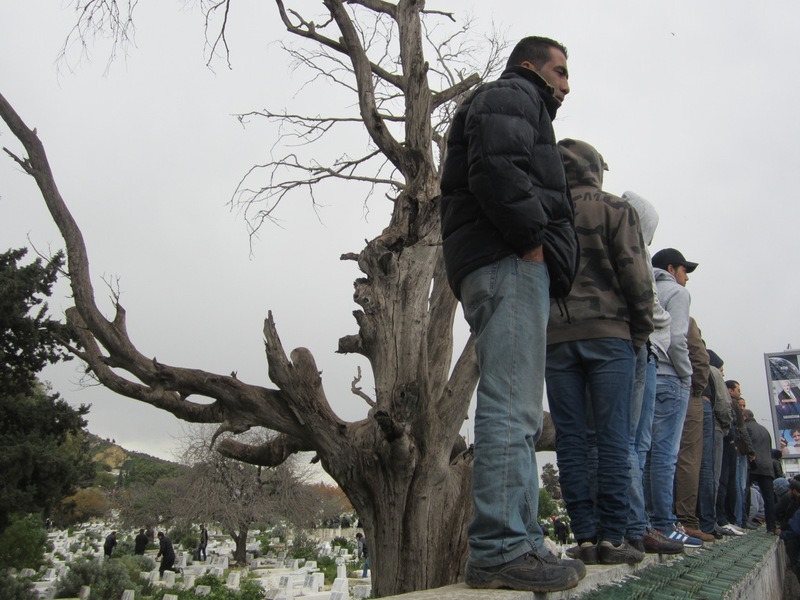 Finally, judging that it was safe, we walked cautiously back towards the centre of the cemetery where Belaid’s coffin would be taken. Black smoke rose on the other side of the area, dark against the grey rain clouds. Young men had taken advantage of the chaos the past couple days to burn cars and rob mourners, some said at knifepoint. We climbed higher up the hill to get a view. The crowd was smaller, but still substantial. A cheer went up, and we assumed that Belaid’s procession had reached the cemetery. Down below, an opposition party leader passed and we hurried to catch a word with him. Then another group of friends met us, and we decided to leave the site together. The thieves had shaken me a bit, and we were careful as we walked back. I’ve been robbed before, and didn’t want to repeat the experience, so I kept a tight grip on my keychain with the whistle attached to it. 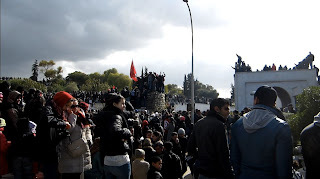 When we reached Bourguiba, it was a changed place. Barbed wire completely enclosed one side, and the pedestrian walkway in the middle. Police and journalists were lined up at the clock tower at the top of the street, waiting for people to come back from the funeral. I waited there for another friend who was leaving her office, and we made our way down a side-street, thinking it would be safer. But at the end, we saw the tell-tale smoke of tear gas and men hurling rocks. I pushed my friend towards Passage, where she would find a cab, and said, “Go home.” Then I started running back to Bourguiba. I slowed when I reached it but walked as fast as I could, trying to outdistance the fear that was gripping my stomach again, and praying staccato sentences in my head. I passed two American women, obviously journalists, who appeared completely unconcerned. I shot them a look that said, “You’re crazy,” and kept walking. Getting mugged by the roving bands of thugs I knew were coming didn’t seem worth it to me, even to get the story. I could see the rock-throwers at the end of my street, and I rushed to get my key in the lock and open the thick metal door. It was such a relief to get inside that I felt like crying- but someone had closed the wooden door within, and I didn’t have a key. I was safe between the doors, but still gripped with a kind of panic, and I called the nun who takes care of the house to get someone to come down and open it. Just as they did, the radio studio called. With my voice still shaking, I gave them a quick update that may or may not have been incomprehensible. When it was over, I sat there for a minute on the couch in the vestibule, just trying to breathe. Once in my room, I shot off a message to my parents that I was safe. I couldn’t handle more than that. The other people who live in my building, a group of Italian students, were gathered on the floor below me, drinking tea and checking online updates of what was happening outside. They watched a live feed of chanting from the funeral. I sat with them for a few minutes, but felt myself fading, so said goodbye. I went to my apartment and got in bed, the echo of chanting and the pop of tear gas still ringing in my ears. I slept until it was dark. One of my friends here says that Chokri Belaid’s death was like a loss of innocence for Tunisia. And when I think back to the day he died, standing on Bourguiba Avenue while my friend cried on my shoulder and sobbed, “What is happening to my country?”, I’m inclined to believe he is right. There was a normalcy to the stagnation and delay of the government. There was a balance, however unsteady, between all the different political and social factions. And there was hope in that fact that people were free to express their opinions in a way that was impossible before the revolution. There was hope that Tunisia could gradually get back on its feet. But with Belaid’s murder, days after he accused the government of not squashing political violence, a fear rose up in people that all they had sacrificed for would be pushed aside. In their anger, fear and sorrow, and without knowing who actually killed Belaid, or why, people are blaming each other. Belaid’s widow blames the government. Certain secular liberals blame Salafists and the League for the Protection of the Revolution. 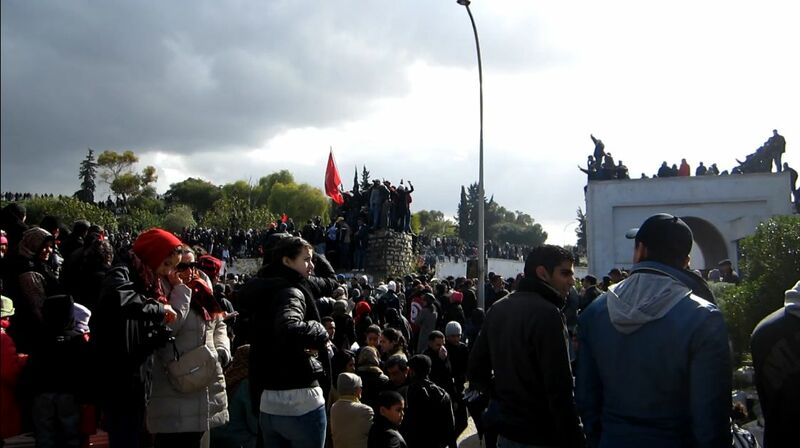 Then, in the aftermath, conservatives blamed France, and some blamed Belaid’s own party for the disruption to the peace. The Western media was quick to point a finger at the “Islamists”, with experts accusing them of being unfit to rule, and sympathetic towards Salafist extremists. This article even tried to tie Belaid’s death with a “violent tide of Salafism” that threatens the entire Arab Spring, an utterly ludicrous connection that those of us who live here know has no basis in facts. There are very few voices of reason, and very few who will talk to each other to try and work out a solution. 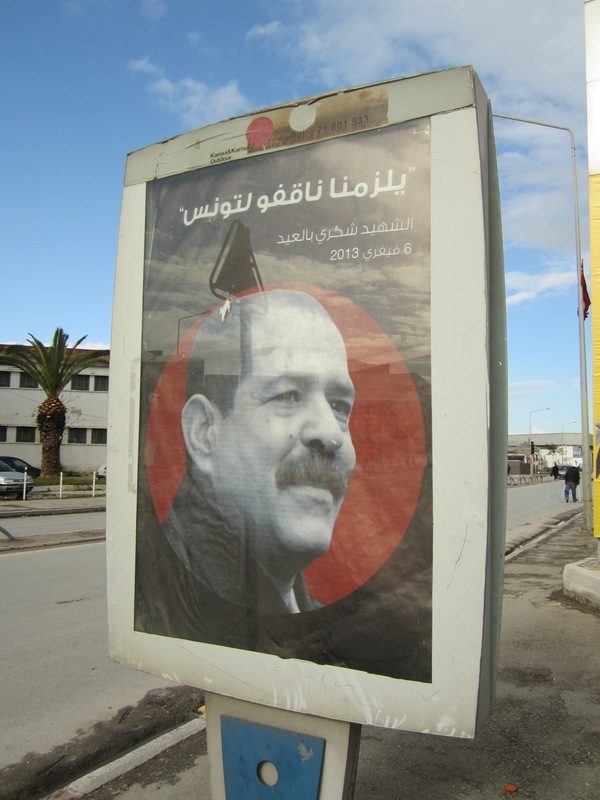 Belaid's death has widened the social, political, economic and religious cracks that separate Tunisians from one another, and the media are doing their part to highlight these divisions. You could say that on February 8, 2013, a lot of the hope that Tunisia had held on to after the revolution was buried deep in the ground with Chokri Belaid. But at the same time, many took his example of courage to heart. I spoke with an engineer at the funeral who told me that he never supported Belaid’s politics, indeed, that he didn’t support any party at all, but that he was inspired by Belaid’s speaking his mind and criticizing the government. Your piece is riveting, Megan. Thank you for posting it. It gave me a window into Tunsia, a really clear, sharp view. I really appreciate your honesty when reporting your own reactions to the day of the funeral. Thanks for sharing & I'll be keeping up with your future reports!